What’s the first thing you think of when you hear the word sushi? Delicious? Special occasion? Expensive? Chances are, “cheap” isn’t one of them. But what if I told you that you can make your own homemade sushi rolls at home – for right around $1.40 per person? Sushi Rolls With Chicken? Can You Even Do That? Making sushi at home seems out of reach for many people. Dealing with raw fish and unfamiliar ingredients, using a sushi mat, and rolling maki can be intimidating. But sushi doesn’t have to be made of raw fish. If you choose to make your sushi rolls with raw fish, be sure to seek out sushi grade fish. But consider experimenting with something different, like I did with these rolls. The combination of teriyaki chicken with creamy avocado and crunchy asparagus was just perfect. I served this at a party I recently attended, and they were a hit. Nobody could really tell that they were eating chicken. One person thought the chicken was tempura shrimp. I’m all for creative sushi fillings and toppings as long as they taste good, authenticity aside. Who can argue with that? Sushi is one of my favorite foods, but I don’t eat it all the often. Mainly because of the price. For 5 sushi rolls, I paid about $7.00 – which comes out to $1.40 per roll. One roll is a good amount for one person. Additional ingredients added to the cost a bit (rice vinegar, brown sugar, teriyaki sauce, wasabi), but I had all of these ingredients on hand. Once you’ve mastered making sushi in the comfort of your home, why not share your skills and throw a sushi party with your friends? You could assign each guest to bring one appropriate sushi ingredient (see below for ideas), and you supply the rice, seaweed, and fixings. And sake. Don’t forget the sake. Visual learners: Check out this video to learn how to roll sushi. 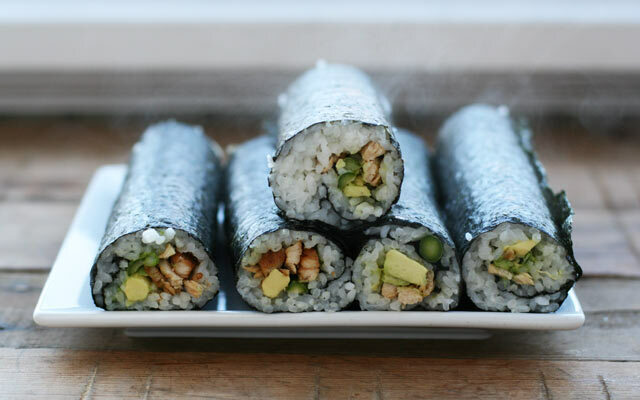 These sushi rolls taste great with teriyaki chicken, avocado, and fresh asparagus. You can certainly sub other fillings, such as cooked or fried shrimp, fried crab, imitation crab meat, tofu, or sushi grade raw fish. Other fresh filling ideas include carrots, cucumbers, kaiware sprouts, cream cheese, or mango. Prepare sushi rice. Rinse rice with cold water. Place in a heavy-duty saucepan with water. Turn heat on to medium-high and bring to a boil. Reduce to a simmer and cover. Cook for 15 to 20 minutes, until rice is cooked. Remove from heat and allow to cool. Once rice is cool, sprinkle with rice vinegar - 1 to 2 tablespoons should do it. Set aside until ready to assemble rolls. Make teriyaki chicken. Slice chicken breast into thin strips. Place in a plastic bag and sprinkle with a few drops of teriyaki sauce, sesame oil, and a pinch of brown sugar. Mix in bag and place in fridge to marinade for an hour or so. Fry chicken in a bit of olive oil for 3 to 4 minutes, until chicken is cooked through and slightly crisp on the outside. Remove from frying pan and set aside to cool. To assemble sushi rolls: Using a sushi mat, lay seaweed shiny side down. Top with sushi rice (enough so that the seaweed is covered, leaving the top inch or so bare) Top with additional ingredients (chicken, avocado slices, and asparagus). See photo above in post for a visual. Start rolling the sushi from top to bottom, making sure that you are keeping the roll tight - you don't want it to fall apart when you slice it. Repeat with remaining rolls. This should be enough to make 5 rolls. Wrap and cut: Wrap rolls in saran wrap and store in fridge until ready to cut. Use a serrated knife to cut each roll into 8 thin slices. Serve with ginger and wasabi on the side. These were declared to be yummy by our granddaughter. They are delicious! Thank you! Well all fine and dandy, I was tired of paying those high prices as well so decided to, “Do it at home”. Well I had nothing so went to my goto guy, Amazon. After searching a good month for all the stuff you need just to manufacture your first roll ( less food cost) like; sushi kit, sushi knife, sushi rice, wasabi paste, soy sauce, nori seaweed sheets, rice vinegar, and pickled ginger. My total for everything was an amazing only on Amazon $68.00. This was the lowest price on everything, for instance, sushi knives are not cheap, they must be razor sharp so $150.00 for a knife wasn’t uncommon, I paid $9.99 amazon, oh, it’s the sharpest knife in my box now and works wonders, it cuts carrots like sticks of butter. I’m sure if one isn’t careful it will go to the bone toot sweet. After purchasing around ten bucks worth of sushi food items for my six guests for dinner, my first rolls cost $15.00 give or take a buck or two. Here’s my after-thought, How often is this wasp going to want to make sushi at home, the rice is a project to get right, I still have left over sushi stuff to make enough sushi for a month and am missing out the bar experience with the guys cutting and rolling and kibitzing. You want cheap sushi, go make it yourself, for me the cost was just to high. This sushi looks amazing!!! I always wanted to make sushi at home with my sushi making tools by Susheff because it is much cheaper than the restaurant. I hope I can make the perfect sushi for my kids with the help of this awesome article. Thanks for sharing such an amazing sushi recipe. Rice vinegar is disgusting, I put it in my sushi and had to scrap an entire meal because it tasted like absolute crap.